A positive DC offset of several Volts triggers the horn/whistle on O-gauge conventional control. Any engine with a horn/whistle has this detector circuit built-in. And there are after-market boards or upgrade modules with same detector capability. 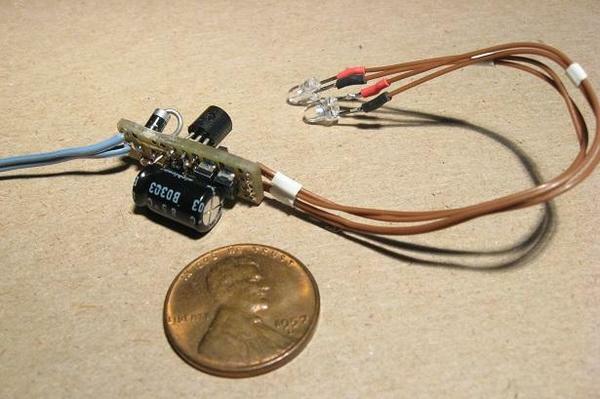 You can roll-your-own DC offset detector for less than $1 in parts. And if the application of DC offset detection is to simply flash alternating LED ditch lamps, you can integrate both functions for another $1 or so. There is a lot of tedious component-level assembly. Two wires on the left bring in AC track voltage. When DC offset is detected, the two white LEDs (3mm diameter suitably sized for most diesel engine ditch lights) alternately flash. The trick, if you can call it that, is to isolate or separate the DC offset from the 60 Hz AC voltage. You are trying to find a few volts of DC in the presence of 18V or more of AC. The filtering of the 60 Hz is a simple Resistor-Capacitor filter shown above using a 100K resistor (R5) and a 4.7uF capacitor (C4). This is a simple 1-pole filter with a time-constant of RxC = 100k x 4.7uF = 0.47 seconds. This is equivalent to a so-called corner frequency of 0.3 Hz. Such a filter will knock down the 60 Hz AC track voltage amplitude by some 100 times. So the 18V AC gyration are become less than a 1/4 Volt which in effect leaves just the DC component of the track voltage. 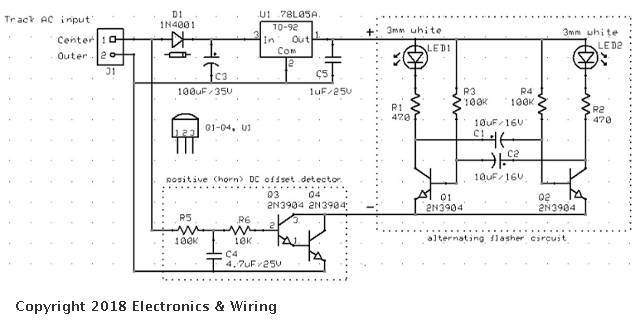 This filtered detector voltage triggers a pair of transistors set up in a so-called Darlington configuration which essentially turns on when its input exceeds about 1.2V DC. When the Darlington-pair turns on, it provides 5V DC power to a widely used oscillator circuit which flashes a pair of LEDs. The circuit uses readily available, low-cost components available in thru-hole or surface-mount packages depending on your preferred assembly method. C4 should be non-polarized uch as a ceramic or bipolar type. If the 2 input wires are reversed to the track, this circuit would flash the LEDs when the Bell button is pressed - that is, when a negative DC offset of several Volts is impressed on the AC track voltage.